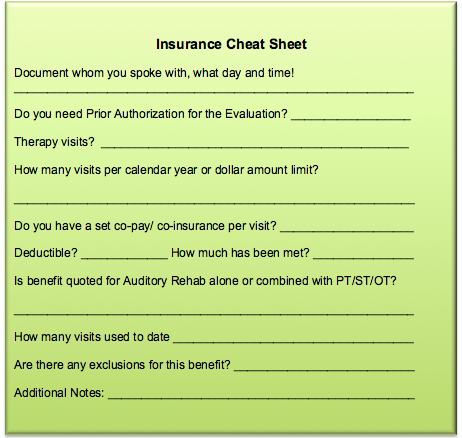 When calling your insurance company to check on benefits for Auditory Rehabilitation, Auditory Verbal Therapy or Auditory Processing Therapy utilize the "cheat sheet" below. It can be daunting when dealing with insurance companies regarding the health coverage of auditory rehabilitation or auditory-verbal therapy sessions for you or your child. Below are some insurance terms you may come across when dealing with insurance. Co-pay: People are most familiar with a co-pay. This is the specific amount of money that you pay for certain services. It may be $15 co-pay for a doctors visit, a $25 co-pay for a prescription but either way you know exactly how much you will need to pay and it DOES NOT change based on the cost of the service. 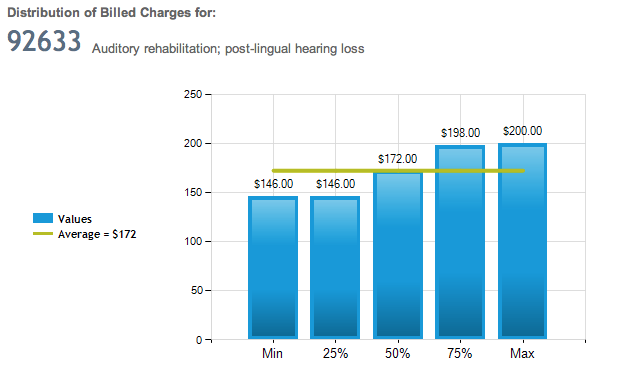 You will pay your $15 co-pay whether the doctor charges $300 or $3000 for that service. Deductible: This is the specified amount of money that you will pay out of pocket BEFORE insurance begins to cover any portion of the charges. It is important to specifically ask if a patients deductible has to be met prior to insurance kicking in as there are many plans that have a deductible, however, the patient does not have to meet the deductible for speech therapy services prior to insurance kicking in. Maximum out-of-pocket: This is the maximum you will have to pay in a year. It is an accumulation of your deductible, co-pays and co- insurance. After the maximum out-of-pocket has been met then insurance will pay 100% for the remainder of charges. Prior authorization: Prior authorization is pre-approval from your health insurance plan that the specified service WILL be covered. If your health plan requires prior authorization for a service then it is required for you to obtain this approval BEFORE you have the service done. Otherwise Insurance can deny it even though they may have otherwise covered it. Most health plans have forms on their websites to download, fill out and fax in to get this approval. You will need to send the evaluation report, if available. ICD-9 code: This is a coding system used to describe signs, symptoms, conditions, injuries or diseases. (NOTE: ICD-10 will begin in October 2013). Exclusions: These are specific conditions (ICD-9 codes) not covered by an insurance plan. Appeal: This is the course of action you can take when coverage of a service has been denied and you would like the insurance company to re-assess in the hopes that they may change their decision and cover the service previously denied. Allowed amount: This is the amount that an insurance company bases their payment on. It is not necessarily the amount that the provider billed. For instance, the provider may bill $130 for a service however; the insurance company only allows $100 for that service so the co-insurance amount is based on that allowed amount and not the billed amount from the provider. In-Network: Most insurance plans have different coverage based on whether the provider is "in-network or out-of-network". Co-pays, Co-insurance and deductibles are often lower for in-network providers. To be considered in-network, the provider has to have a contract signed with the insurance company. The downside to this, for a provider, is that this contract often limits the amounts that the provider can charge the insurance company for a particular service and the insurance company does not allow a provider to bill the patient for the amount over what insurance allows. 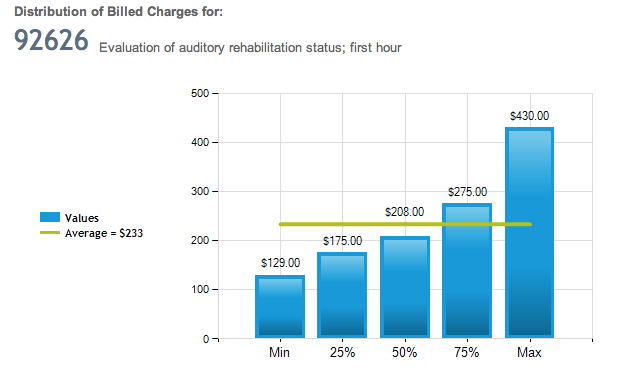 provider to bill $250 for a particular service but that provider normally charges $300 for this service. If your co-pay is $25.00 then you will pay $25.00 in addition to the $50 not allowed by insurance. Especially with the big changes happening with health insurance, many providers choose to be out-of-network providers so that they do not have to take such a big deduction in their reimbursement rates. Medical Necessity: Many insurance plans will only pay for services that they feel are "medically necessary", this often means that they will require reports from therapists, physicians, etc. and will utilize their own professionals to conduct an evaluation of these reports in determining if there is a medical necessity for the patient to receive the services in question. Explanation of Benefits (EOB): This is a summary of the billed service where you are able to see what portion was applied to deductible/co-pay/co-insurance, etc. It will also tell you when services are denied and why.